It's probably going to be Thursday when you read this since I'm not posting it until almost-bedtime on Wednesday, so don't be thrown off all day by the title (I know I would be). And if you are, just drink another cup of coffee. It'll do ya right and besides, it's almost the weekend--so chin up! I'm a ballet dancer at heart. But despite loving to wrap the ribbons on my pointe shoes, I always longed to dance on ice. It seemed so freeing to be able to essentially do ballet while gliding. Ahhh, the freedom and beauty (and difficulty)! This winter, I signed up for some adult skating lessons to learn the basics and improve my skills. My mom was a figure skater, complete with her own backyard practice rink, but I've always just enjoyed it and never taken a lesson before. I am absolutely LOVING this addition to my routine, and learning the basics makes it a new workout (um, hello there, lower back muscles, haven't seen you in awhile since my dancing days!). 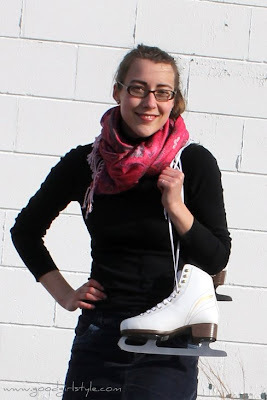 I love to skate in leggings, legwarmers, and a skirt for ease of movement. This really leaves my body free to concentrate on grace and form from my ballet days. Plus, I'm just totally enamored by the look and it gave me an excuse to pull out my old legwarmers! After class, I'll plug in my iPod and skate by myself for awhile.